Niger Basin Authority, Niamey, Niger Republic. month of April, May and June are its most critical low flow periods. 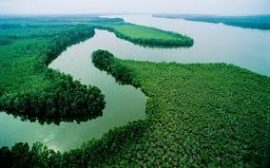 conservation of the river Niger. Armageddon, in terms of its cataclysmic socio-economic and political effects on the nation. Key words: Low Flow, Climate Change, Inundation, Conservation, Disappearance, Reservoir Storage, Sustainable Development, Ecosystem Conservation.